The differences between the two are subtle, but have big implications in the definition of the geometry. It all has to do with a curve that considers the curvature of the surface. Geodesic Offset: Creates an offset distance that is the shortest possible distance between the selected edge and the resultant offset entity, taking the support curvature into account. 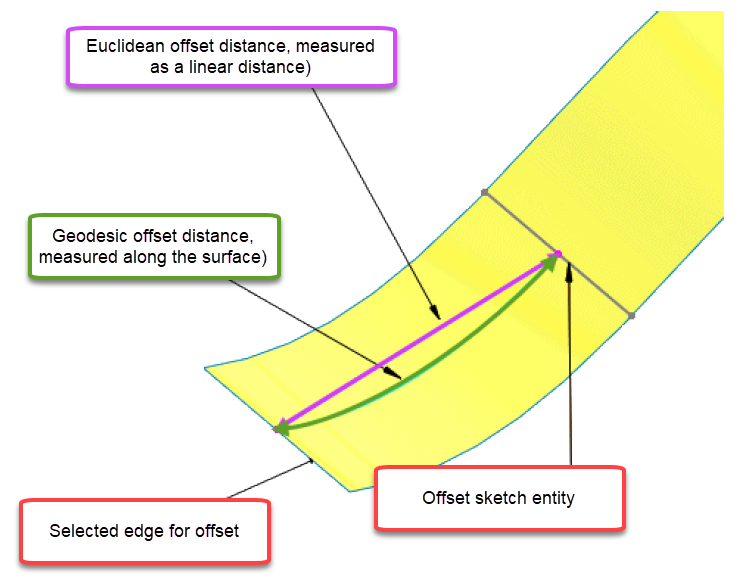 Euclidean Offset: Creates a liner offset distance between the selected edge and the offset entity that does not include the curvature of the surface. In other words, a geodesic offset distance is measured along the surface (shown in green), while a Euclidean offset distance is measured as a linear distance (shown in pink). We know a lot of users are extremely happy to see the expansion of the Offset on Surface command to include this functionality. It is a welcome addition for those creating complex, curvy shapes. With this and the dozens of other new tools and expanded functionality, what will you create with SOLIDWORKS 2019?